I'm a relatively new cozy mystery listener and after listening to this book I can understand why they are popular - assuming that is, that most are this well thought out. I thoroughly enjoyed the characters, and the setting was somewhere I would like to visit. It's quaint and cute, with a side of romance and a little mystery that needs to be resolved. I am happy to say that there were many plausible clues to solving the who-dun-it. The story was a little slow to start, as are many stories, but don't give up! I was eagerly interested in hearing the ending and seeing where the romance was going. 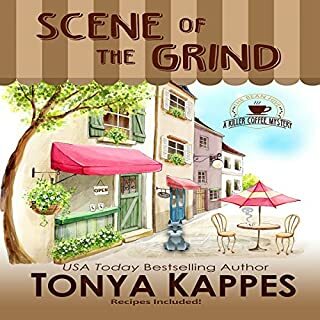 I just loved the scenes at the coffee shop and Roxy's interactions with her eccentric assistants. The narration was excellent. I've listened to Ms. Mrozek before and she seems so comfortable in her characters. She really owns Roxy and does a lovely job voicing all the additional characters with charm and personality. Her accent is natural and believable. If you haven't listened to Madeline Mrozek, you are missing out. Before Nancy Drew, there was Violet Strange. When an investigation requires someone who can infiltrate a clique of young women, the firm hires Violet Strange. Those in society begin to whisper when valuable items are stolen, then mysteriously returned, everywhere the five Inseparables go. Can Violet find the culprit before those whispers turn to accusations? This was the perfect audiobook to listen to before falling asleep. The most interesting part of the story was the idea of soliciting the assistance of Violet Strange, a woman, as a detective. (considering the time period) But Violet proves with her intuition and wit that she can solve the case. The narration was youthful and precise. Initially I though the pacing was a bit fast, but once the story gets going it's just right. I enjoyed listening and I'm assuming there are other Violet Strange books. I would certainly listen to more in the future. The cover is great as well. *I received this audiobook in exchange for my honest review from Audiobook boom. 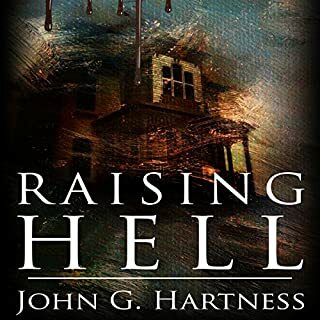 I had previously listened to the first two stories in this collection and thoroughly enjoyed them, so I anticipated that I would like the last two stories just as much. I didn't, however, anticipate liking these stories and characters even more. Quincy gains character depth as this series progresses without loosing his snark or attitude, and even shows a little tenderness when it comes to kids. The backstories of all the characters were interesting and well thought out, and you get a sense that there is even more to these characters waiting to be discovered. What is not to love about James Foster's narration? He IS Quincy Harker, and masterfully brings to life the supporting characters, with talent and style. I don't frequently re-listen to an audiobook, but this collection is one of those gems that will get listened to more than once. I hope Quincy has more stories to tell. 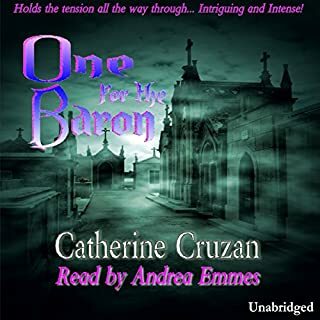 I received this audiobook from the narrator or author via audiobook boom in exchange for my honest review. This book had my complete attention in the first 2 minutes, and I loved that! 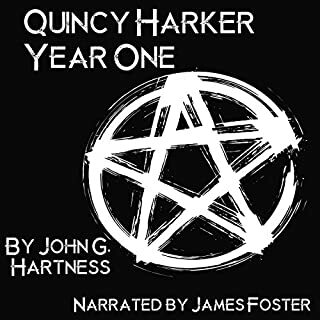 The main character, Harker, reminded me a bit of Harry Dresden, but Harker is a darker character. His character is so well developed that I instantly liked him and I was really disappointed when this book ended so quickly. The storyline was well written and had a satisfying ending. The best parts about this book were the characters. The characters were seamlessly introduced and each so unique from one another. A lot of books have supporting characters that are forgettable. This is not one of those books. I wanted to learn more about all the supporting characters. James Foster rocked this book. His narration brought each of the characters to life. 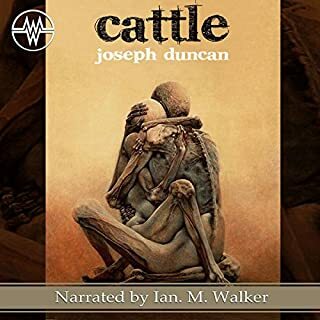 This was the type of narration where you forget you are listening to a narration at all, because the narrator has you feeling like you are right there in the story. 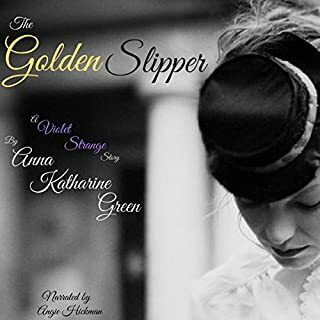 I would absolutely recommend this book to anyone who enjoys this genre, and I hope the author and narrator team up on future adventures with this fabulous cast of characters. Daniel Montague has a secret. A secret so dark, so disturbing that he's pushed it to the back of his psyche and moved on. Unfortunately for him, it's itching to find the light. Down in New Orleans, Daniel finds solace in the winding waters of the Mississippi River. He's found a place that he can put his past behind him, a place that he can call home. This was an interesting mystery thriller set in New Orleans. You don’t have to wait long before the bodies start to pile up, and although there are some early clues, the story definitely keeps you guessing. I really enjoyed the way the author created a nearly palpable dark, seedy atmosphere throughout the book. What I enjoyed most was that I thought I knew exactly how this story was going to end and found myself changing my theory twice during my listen, and the end still surprised me. I would have liked to have known more about the character Tom, who wasn’t fleshed out much; but besides that the only downside to this book might be the Vietnam flashbacks thrown in at various times. I felt at times they were disorienting to the main storyline. However, by the end of the book I felt those flashback scenes did help to flesh out the character of Daniel, and what I perceived as his emotional distance from his wife and friends. I thought the pacing of this book was just right. The story wasn’t rushed, but also didn’t drag on unnecessarily. The narration in the audiobook was top notch. Paul Woodson’s voice was essential to the creation of the atmosphere that I so enjoyed. The narration was consistent, well paced, and the character voices were easy to discern from one another. There were two significant female characters in this book and the narrator did a good job voicing those female characters, which is a bonus. I am looking forward to listening to other books narrated by Paul Woodson. I received a copy of this audiobook in exchange for an unbiased review from audiobook blast dot com. Captain Hook has reason and wit behind his hatred for Peter Pan...If only someone would listen. I will never think of Peter Pan and Captain Hook the same way again. This is an engrossing and well written background story. The characters were believable and even though this is only a 5 hour book, in those hours you really got to know the characters. 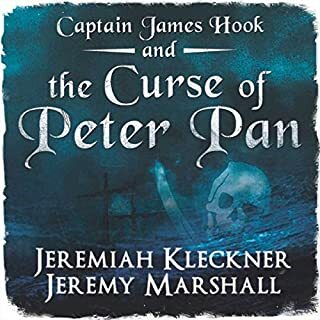 I enjoyed that the story opened with Hook as a boy, a boy who clung onto the characters from his childhood while growing up in the company of pirates. His realization at the end about the events which lead to his father's demise brought the story full circle, leaving me completely cheering for Captain Hook. The narration by David Stifel was brilliant. The true voice of a storyteller, and one of the best male narrations I've listened to in recent years. The narrations that truly grip me are those where I forget there is a narrator and get "lost" listening to the character. This was that type of narration. David Stifel's Hook is dignified, loyal, and intelligent. As a parent I can also say this is an appropriate book for kids probably ages 9+. Although there are scenes of sword fighting and death, none is described in graphic detail. I think kids, particularly those who like pirate stories, would really enjoy it. The narration is articulate and would be easy for kids to understand. I have already recommended this audiobook to friends. It is 10 years after the global apocalypse. The Phage, the zombie virus that brought the world to its knees, has mutated, restoring the minds of its undead victims: their personalities, their memories... even their dreams. The living dead are no longer the mindless monsters that drove mankind to the brink of extinction. I do not typically like zombie novels. Zombies stories, movies, and tv shows are everywhere it seems. That said, I felt compelled to listening to this one after hearing talk about how the narrator voiced the zombie characters. Wow. Mr. Walker did a fantastic job with those zombie voices! The narrator voice was also well done. He was consistent and well paced throughout the entire book, and has a voice that I find easy to listen to. I particularly enjoyed the voice for the main female character in the book. The story was so much better than I expected. I found it's ideas interesting, and parts of it caused me to recoil a bit. But that's what makes a book interesting, right? I want a book to surprise me, make me laugh, or make me shiver. The writing was good, and as the book neared the end it required I stay up a bit later to get to the ending. Some characters seemed to be more fleshed out than others, and I was most intrigued by the character of Harold. I frequently measure a book by how long I think about it after I am done listening to it. This one is going to keep me thinking for awhile, and I will definitely be recommending this book to friends. I haven't listened to many audiobook short stories, but this was really fun. 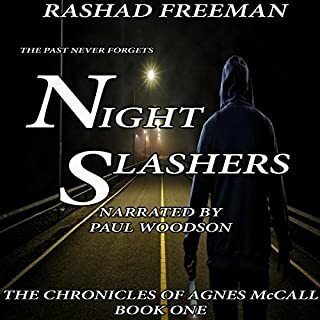 The author does a nice job introducing the main character, and for me she was a likeable character that I found ways to relate to, which I find an important quality in books I read or listen to. I was a bit surprised by the abrupt ending though, and was really wishing there was a bit more told. Sometimes, however, it's nice to let the listener come to their own conclusions.